A YOUNG AND TALENTED FEMALE ARTIST. HER WORK HAS INSPRIRED BY THE BED TIME STORY, IT’S THE WORK OF SWEET, FANTASY AND MYSTERY. AN ORIGINAL LATE 80’S – EARLY 90’S INDIE POP BAND WITH A NEW SINGER ‘OOH’ FROM ‘DAY TRIPPER’. THE BAND WILL RELEASE THEIR BRAND NEW SINGLE ‘BREAK THE WALLS’ WITH ‘SUMMER DISC/ RIDE THE TIGER’ IN THIS WINTER 2010, DO NOT MISS!!! 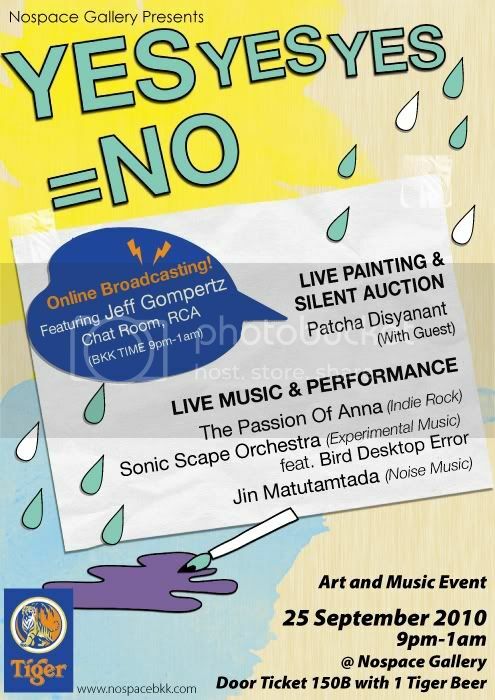 A GROUP OF ARTIST AND MUSICIAN THAT JOIN TOGETHER ONLY FOR JAM SESSION AND SPECIAL EVENT. THEY MADE UNIQUE EXPERIMENTAL MUSIC FOR SPECIFIC SHOW, WHICH SOUND ACCORDING TO THE ENVIRONMENT AND ATMOSPHERE. THEIR SHOW IS VERY RARE AND NO REPEAT!!! A NEW, YOUNG AND OUTSTANDING EXPERIMENTAL MUSIC PERFORMER, SPECIALIST ON NOISE MUSIC. JIN COMPOSES HIS TRACK BY USING BOTH DIGITAL AND ANALOUGE NOISES FROM HIS INVENTED INSTRUMENTS, WHICH MADE BY TRAFFIC CONE FROM THE STREET, MEDICAL EQUIPMENT FROM HOSPITAL, BLACKBOARD AND CHALK FROM SCHOOL, PRINTER FROM OFFICE, TO THE DIGITAL MUSIC GEARS. NOSPACE RECOMMENDED!!! JOIN THE AUCTION FOR PATCHA DISYANANT’S ARTWORKS BY SMS TO 0841341184, THE AUCTION CLOSE AT 1AM, NO RESERVED!! !